Mostly everyone loves Laddoo. It can be prepared for any ceremonies – be it weddings, engagements, house warmings, or for god/goddess specific poojas. It can be prepared for any festivals like Diwali, Navratri and Ganesh Chathurti etc.It get’s-done quickly without any complications involved in making them.This Diwali I prepared these Ladoos.They taste very delicious. 1) In a bowl, sift the chickpea flour / Besan .Sifting avoids lumps. 2) First warm the ghee in wide bottomed pan on low heat. If it is solidified, then it will melt. Don’t overheat. Warming it is enough.Take it in a bowl and keep it aside. 3) Fry cashew nuts and raisins in some ghee and keep aside. 4) In a same wide bottomed pan roast the rava on medium flame till you get a pleasant aroma and set aside. Make sure it is not burnt . 5) In a same pan add Besan Atta and 1/2 cup of melted ghee and stir continuously. Occasionally add remaining ghee into it. Keep stirring till the flour becomes golden brown and ghee separates and nice aroma comes out of it. Whole house will be spread with that nice aroma.. Add the roasted rava to it and heat the mixture for about 1 minute while constantly stirring. 6) Remove from fire ,set aside to cool down a little. 7) After cooling ,add powdered sugar, cardamom powder, and fried cashew nuts and raisins. Mix well.If you want to garnish then keep some cashews and raisins aside. Using lightly greased hands, Shape into small rounds or ur desired shapes when still little bit warm.You can garnish with cashews or raisins. 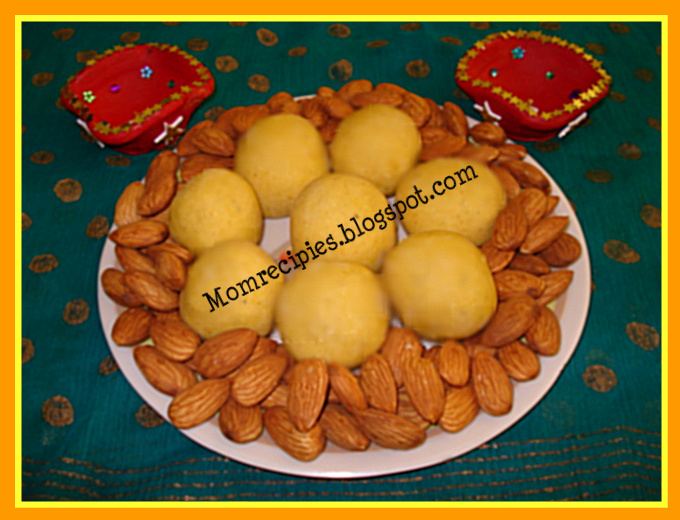 8) Store Rava Besan laddus in an airtight container. 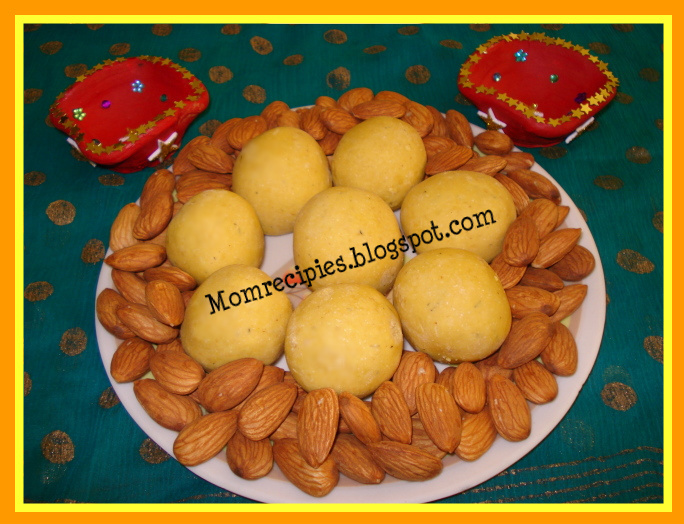 Note : If it's difficult to make ladoos, you can add some melted ghee, if needed.